Happy New Year! I hope your holiday season was as fabulous and unforgettable as mine. One of my favorite holiday gifts was a gift certificate from Barnes & Noble, which helped me to complete all six annotations by Harvard University Press of Jane Austen’s best known novels. I quickly purchased Northanger Abbey, which I’ve been perusing since receiving it a few days ago. Susan J. Wolfson, professor in the Department of English at Princeton University, edited this edition, which has an extensive 60-page introduction. The book’s format follows the five other annotations – Pride and Prejudice, Sense and Sensibility, Mansfield Park, Emma, and Persuasion – with Jane Austen’s text in the center and the annotated commentary placed on the far right on uneven pages or far left on even pages. Descriptive images of Bath, a poste chaise, or fashions of the day provide a visual punch to this annotation, as do the well-chosen images in the other books. Two-page spread of pages 112 & 113 of Northanger Abbey, annotated edition. For readers who were lucky enough to receive gift cards for books, I cannot recommend these gorgeous hard-cover books enough. My dear friend Kate is a member of our select and very small Janeite group, Janeites on the James. We’ve not met often recently due to busy schedules and life’s vicissitudes. When Kate’s wee one was born almost two years ago I gave her the board book Emma by Jennifer Adams to read to her daughter. Our sweet peanut, as she is affectionately known, loves to hear her mama read Emma. Jennifer Adams has written another series of books for toddlers. Peanut’s Papa may soon be sent to Paris for several months on a business venture. Coincidentally, Jennifer Adams has written another series of books for toddlers, this time taking them on a tour to famous cities – like Paris, New York, San Francisco, and London. You can imagine our wee one’s delight in reading these books designed just for her age group. Evie, or Peanut, reading Paris, where Daddy might be stationed. This beautifully illustrated series also includes more detailed information for parents at the end of each book that they can explain to their budding globe-toddling child. Kate tells me that Evie reads her book independently now. Her reaction? Priceless!!!!! Though in the course of fifty years I have forgotten much, I have not forgotten that Aunt Jane was the delight of all her nephews and nieces. We did not think of her as being clever, still less as being famous: but we valued her as one always kind, sympathising and amusing. Jane Austen’s connection to us and our children remains strong to this day. 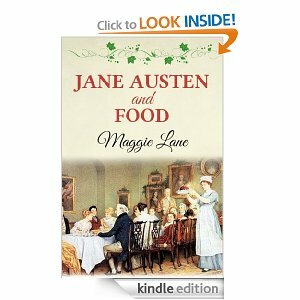 Jane Austen and Food by Maggie Lane is not a cookbook with recipes, but a well-researched, highly informative, and entertaining historical discussion about food, mealtimes, manners, and housekeeping in the age of Jane Austen. 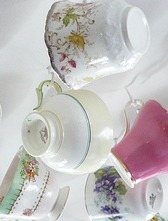 Lane examines Austen’s letters regarding food and drink, and how she uses both to define the characters in her novels. In Steventon, the glebe lands (which added to about 3 acres) supplied the Rectory with pork, mutton, wheat, peas, barley, hops, and oats and hay for the horses. The surplus in produce contributed up to £300 per year to the Austen’s income. They made their own mead and wines and preserved foods that were produced with foods in season. The only commodities that were purchased were expensive items like tea, coffee, chocolate, sugar, spices, and dried fruits. In terms of food and its purchase, the Austen’s move to Bath was a shock. Slow transportation changed the quality of the food that Jane and her family were accustomed to, and the very fact that they had to purchase all their produce made them anxious, for they had lost sources of revenue in the form of farm produce, pupils, and Reverend Austen’s clerical stipend. Milk was of a poor quality due to the cows being kept in unhygienic barns, and food, purchased at the bakers, grocers, butchers, poulterers, and fishmongers was quite expensive. In addition, its cost fluctuated. At Chawton Cottage, the Austen women were able to find their footing again, growing their own fruit and vegetables, rearing poultry, keeping bees, baking bread, and making wine and brewing beer. Villagers recalled in later years that their dog, Link, would carry home a pail of milk in his mouth. It must be emphasized that, although Jane Austen worried about financial security, she and her sister and mother were comfortable enough to eat well and, like Emma Woodhouse, to dispense charity to those less fortunate than themselves. If Jane envied others, it was for their freedom from perpetual contrivance. In the sale of her novels, she found some relief from such worry. Breakfast, lunch, dinner, and supper are described, but Lane emphasizes that Jane barely mentions these daily events in her letters and novels. She gives scant details, especially as to the preferences of her heroines, most of whom are not concerned with the daily details of food. There are hints here and there in her novels: Willoughby takes porter at an inn during midday, and Frank Churchill imbibes spruce beer on a hot day at Donwell. I could go on and on describing the enormous amount of information in this ebook. Lane goes on to discuss in great detail the attitudes towards food and domesticity in Northanger Abbey, Emma, and Mansfield Park – all of which excited this reader. The characters of Emma Woodhouse, Mr. Woodhouse, Mr. Grant, Mrs. Grant, Mrs. Norris, Mr. Price, and General Tilney are elaborated in great detail in their obsession (or not) with food and general housekeeping details. Is Jane Austen and Food worth the cost of $2.99? Oh, yes. Definitely. !I paid so much more for my hardback copy several years ago and do not regret its purchase. I give this ebook a rating of 5 out of 5 Regency teacups. Happy New Year, gentle readers. I hope to write more for my blog in 2014. Thank you for your loyal readership. I cannot tell you how much I enjoy your comments and thoughts. Sense and Sensibility: An Annoted Edition edited by Patricia Meyer Spacks. The first is the 4th installment of an incomparable anthology series of Jane Austen’s novels. 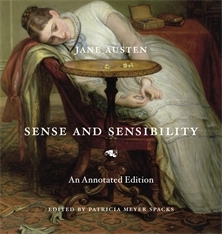 Sense and Sensibility: An Annoted Edition is published by The Belknap Press of Harvard University Press and edited by noted scholar Patricia Meyer Spacks. This lush book could easy be confused for a coffee table book – the cover is so beautiful and the color images inside are of the highest quality, but the annotations are anything but superficial. Dr. Spacks’ research adds dimension to Jane Austen’s words and to an era that is long gone, and whose customs have become foreign to our modern understanding. Her observations include a comparison of characters within the novel – “Miss Steele is as acquisitive in a small way as the John Dashwoods are in a grander fashion”. She also draws a similarity between two novels, nothing that Willoughby is similar to Henry Crawford in that both men have fallen in love with the women they targeted for a light flirtation and amusement. In her introduction, Dr. Spacks elaborates on the 18th century definition of sensibility, which was understood to be derived from the nervous system. Hence, fragile nerves, irritability, hysteria, tremors, fainting spells, and sickness at heart were closely associated with the term (as with Marianne Dashwood’s and Mrs. Bennet’s histrionics). Spacks’s introduction also delineates how Austen conceived of the book and how Elinor and Marianne cannot easily be pigeon-holed into the two separate categories. As they grow in understanding, both women possess elements of the other’s characteristic. As most of us know, Jane Austen wrote the first draft (known as Elinor and Marianne) by the time she was 20 years old. 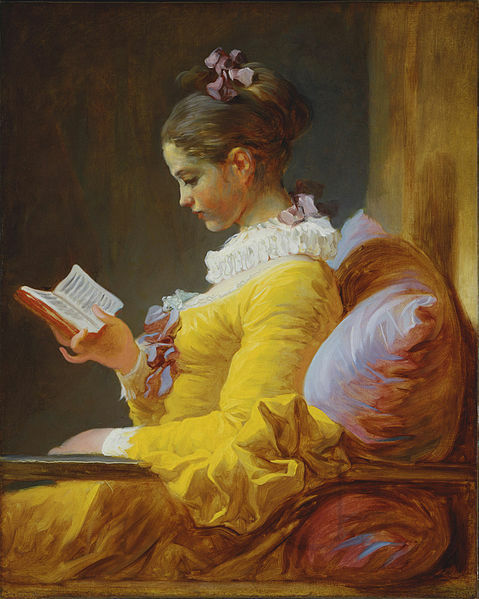 The book, written first in epistolary form, did not assume the third person narrative until 1811. Perhaps this is the reason why a number of passages in the book seem to lack detail or were uneven. In her notes, Spacks elucidates language and allusions that have become obscure (What are Nabobs? When is rent day? 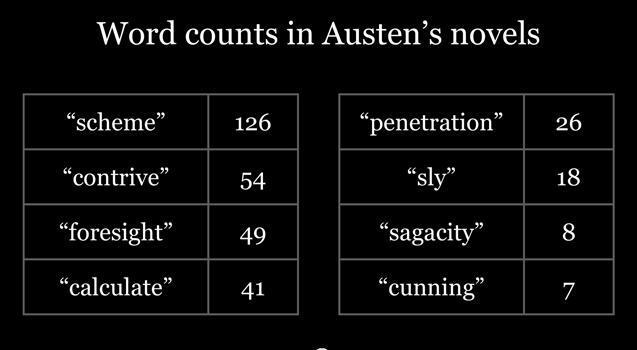 ), draws comparisons to Austen’s other work and to that of her precursors, and gives an idea of how other critics have seen the novel. In her introduction and annotations, she explores Austen’s sympathy with both Elinor and Marianne, the degree to which the sisters share “sense” and “sensibility,” and how they must learn from each other. Both manage to achieve security and a degree of happiness by the novel’s end. Austen’s romance, however, reveals darker overtones, and Spacks does not leave unexamined the issue of the social and psychological restrictions of women in Austen’s era. One get the strong sense that Spacks prefers Willoughby as a hero over Edward, whose character is rather tepid and static. Colonel Brandon’s mature patience doesn’t fare much better in some of the annotations, which also include extensive descriptions of manners, mores, and historical facts. Mundane customs are described, such as the games of whist and cassino. Home, hearth, and space play important roles in this novel.The country side affects Edward more than Willoughby, who regards the land merely as a place in which to hunt. Edward will eventually live off the land, and happily so. Ennui, or inertia, is also evident in the novel’s characters. Spacks quotes the scholar, Isobel Armstrong, who observed that “a long, patient but sapping wait is the fate of many in this novel; Edward, Elinor, Colonel Brandon, even the unsympathetic Steeles.” Perhaps this is the reason why so few of us think of Edward as a strong hero. His character lacks decisive action. When he does make a decision, as with his unfortunate choice of fiancee, he seems stuck and unable to make a move when encountering a road block. The conniving Lucy spends considerable time waiting for Edward and hoping that Mrs. Ferrars will come around to accepting her. Most of her machinations (that of seducing Robert Ferrars) occur off the novel’s pages and we hear about her success in marrying Robert only through word of mouth. My one complaint about this edition is that the annotations seem spare compared to Pride and Prejudice, the first annotated book edited by Dr. Spacks. To be fair, Sense and Sensibility is not as highly ranked on most reader’s lists as Persuasion, Pride and Prejudice, or Emma. It is the earliest of Jane Austen’s published novels, which may explain why the number of annotations seem to be fewer in this book. Nevertheless, I highly recommend this edition, which costs $35, a bargain considering the the number of colored illustrations and information contained therein. Northanger Abbey is the next novel to be annotated. It will come out in spring of 2014. I cannot wait for it to be published. 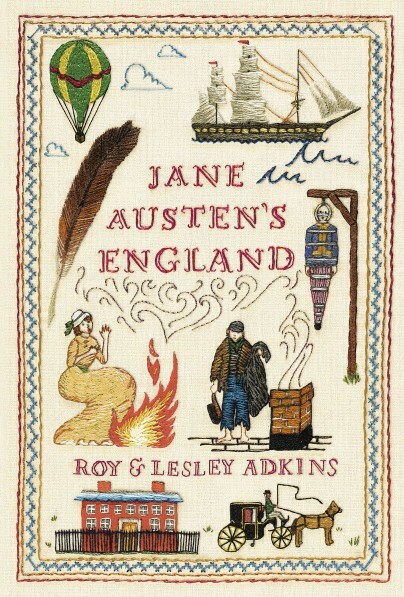 The next book on my recommended buy list is Jane Austen’s England by Roy and Lesley Adkins. Actually, I should amend my ranking, for both books are equal in my estimation. The publisher sent an uncorrected proof of Jane Austen’s England when I was in the throes of taking care of my parents this past summer and fall, and so I read the book piecemeal, hoping to find the time to give it the review it deserved. My copy is earmarked and underlined. I have read many passages twice. Roy and Lesley Adkins have accomplished a remarkable job of research and writing that informs as well as entertains. I realize that many of you have read a number of histories associated with Jane Austen’s age and some of you will find the information repetitive. In addition, you can easily find many of the sources used for this book on the Internet or for purchase. 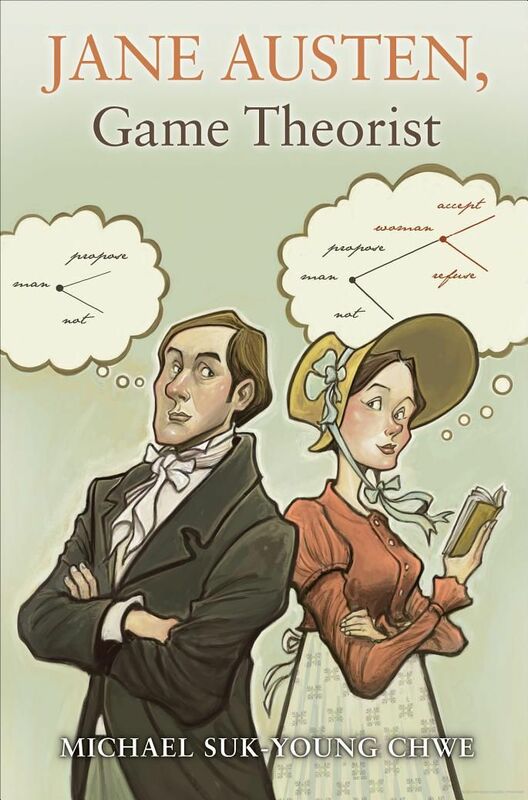 This book is divided into topics that follow the lives of Jane Austen and her characters. While the historic territory that the Adkins go over is not unique, their presentation is organized in such a way that all we need to do is to turn to Breeding or Toddler to Teenager to Wealth and Work and Medicine Men to find out more about the daily habits of the Austens, Jane’s characters, or the socio-economic conditions of those who lived during the Regency era. The Adkins do not subject us to mere romantic assumptions, but relate the harsh reality of life for the majority of people living during that age. The chapter on Filth minces few nice words. This was an era when outhouses abutted to sculleries, cholera was spread through contaminated water, and cesspits drained into watercourses. Men and women were known to urinate and defecate in streets. While our dear Jane did not write about these indelicacies, she must have witnessed such actions and known of many more contemporary customs that would turn our heads today. In her novels, she ignored the harsh realities of war and famine, common occurrences in her day, and assumed that her readers would seamlessly fill in the details of daily life while she concentrated on her character studies. Topics in Jane Austen’s England include kidnapped children, superstitions and folk wisdom, the use of Almanacs (useful for planning evening parties during a full moon), boundary stones, funeral customs, tax burdens of the rich and poor, Frost Fairs, animal fighting, animal abuse, hunting, cricket, horse races, regattas, amateur theatricals, London theatres with their noisy audiences, the cost of music tickets (two weeks wages for a servant), ballad sellers, public houses, taking snuff, state lotteries, the cessation of the Grand Tour during the Napoleonic Wars, the danger and challenges of travel and transportation, boot scrapers, toll roads, toll booths, turnpikes, surveying, mapping England, medicine, apothecaries, the royal navy, and more. Whew! Even though I finished the book late last month, I struggle to remember all the fascinating details that this 300+ page book contains. For a New Year’s gift, I am holding a book giveaway of a hard back copy of Jane Austen’s England until midnight, January 7, 2014. All you need to do is leave a comment about an interesting fact you know about Regency life or Jane Austen’s era. Participants are confined to the U.S. and Canada. (So sorry!) Winners will be chosen by a random number generator. You may enter as often as you like, provided that you share another interesting bit of information about Jane Austen’s England each time you make a comment. Happy New Year, all. Thank you for stopping by my blog.